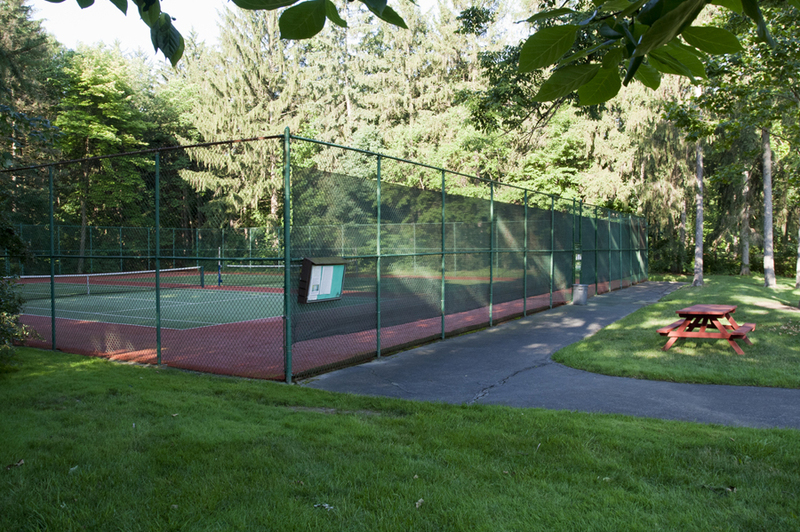 Two tennis courts, located at the back of the clubhouse parking lot, are available to residents and their guests. The east court is for tennis only. The west court is equipped with multi-sport posts and can be used for volleyball and badminton as well as tennis. The courts were resurfaced in 2007 with an artificial carpet type surface that is weighted with sand to provide free draining following rain. The courts are open spring through fall. Reservations for one hour intervals can be made by signing up on the reservation list posted on the court fence. Unreserved courts are available on a first-come, first-serve basis. Tennis shoes are mandatory on the courts and tennis apparel is strongly encouraged. You must have an activity pass and be a resident to use the courts. Guests must be accompanied by a resident. During the tennis season Greenwood players are invited to join the round robin play on Wednesday mornings at 10:00 a.m. We rotate all players in and out in a sequence where both courts are used. Each player has a chance to play with and against all those joining in the fun. All skill levels are welcome. Come join us. Any question, contact Bob or Carmen Park.